Just wanted to share this new layout that I made last night. Actually i was working on another layout but it's taking me forever. I remember this picture of me and my nephew Dither many Sundays ago and when i made some photo enhancements I was non-stop. I love the way it turned out. I bought Christina Renee's Signature kit and i used it for this layout. 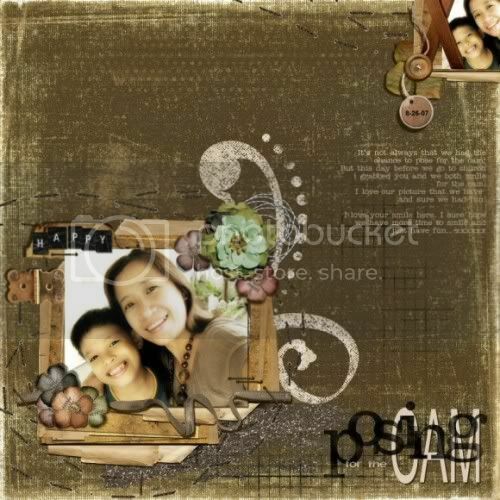 I also finished one layout, actually it was the bday invitation of my mom but i will just share that later. Note: credits will be seen at my DIGI BLOG. Happy Sunday everyone !!! Wow it's October already tomorrow yahooooo.!!! Everytime I see your name it reminds me of the song by Click 5 "Jenny". Love that song!! Hahaha! Sorry been missing for some time... i have a new blog now tho still blogging in myfairy-tale! Check out at www.naturallynesh.com! We can exchange links too if you want. Waaa nice picture oh! Hehehe! So cute the girl! Hi Natash, hmm i have no clue about that song.. but if you liked it i bet it's good huh. Ive added ur link link alrady..